It’s not often that I write about pure technology from a technical standpoint on the Strategic Sourceror. Usually I’m droning on about the benefits of sourcing technology platforms or complaining about end-users over reliance on automation (at the cost of good strategic sourcing practices). But, for once, I figured I’d put my hypothetical “I.T. hat” on for a bit and provide some advice to small and medium businesses that are building out their infrastructure (yes, I too imagine that an IT hat looks like a dunce cap). Today I want to provide a quick thought about network redundancy for the small/medium business. As Microsoft continues to push everyone to the cloud by pushing the Office 365 platform subscription; Google is trying their best to get everyone to switch over to Google Docs and Sheets. Microsoft wants you to store your corporate files in their One Drive product, while Google Drive, Box and DropBox are all also looking to steal the file server and corporate cloud storage space away from Microsoft’s on-premises solutions. And it doesn’t stop there. More and more, we see voice communications headed to the cloud, particularly in the small business sector. RingCentral, Grasshopper, Vonage and others are all selling relatively low-cost and easy to implement solutions that allow businesses to do away with traditional PBX units. Even Verizon FiOS and Comcast are in on the game pushing VOIP instead of traditional phone services (though they cannot yet compete in terms of remote workforce support). And it’s not just the small businesses, the ‘big guys’ are migrating or considering migrating too. In fact, Microsoft this year is making an enormous push into the voice market; having killed the poorly adopted Lync product and having created the new “Skype for Business” solution. Microsoft is even developing hybrid solutions of cloud and traditional services to help smooth the transition of larger businesses into the PBX cloud. "The cloud requires the internet to work." No duh, right? Well, as simple as that sounds, it amazing me how many companies (particularly those with sub 500 employees) are not prepared for an internet outage. It also amazes me the hoops companies jump through in order to restrict the things their employees can access (streaming video, audio, websites, Wi-Fi access, etc.) all in order to keep bandwidth usage at a minimum. While it’s important to keep staff focused and productive, it should also be considered a perk to provide a basic level of internet connectivity to those people (and let them save a few bucks on their overpriced wireless data plans and let their phones online). But back to the point at hand: the cloud requires the internet to work. What I mean to say is that without connectivity, and adequate bandwidth, moving all of your voice and data communications to cloud-based solutions is an incredibly risky proposition. Do you send everyone home to telecommute if your crappy coaxial cable internet service goes down? Do your phones stop working (potentially losing customers) when your internet hiccups? Are you prepared for an outage in any way other than having your service provider’s tech-support phone number and your account number handy if your internet goes down? Few companies are, particularly smaller organizations. This is precisely why you need some level of internet/voice/data redundancy in your business; regardless of how big or small your operation is. Most people immediately relate redundancy to excess costs. Or, they struggle with the challenges of bringing two different internets into the same network/office (especially if you don’t have a full-time experienced IT staff). No worries, that brings me to the point of this post…. You need to learn about Peplink. I apologize in advance for sounding like a commercial, but this product is definitely something a small or medium sized business (especially ones that rely on the cloud) need to know about. Stick with me while I get technical, then switch back to English. For about the cost of an inexpensive small office firewall you can have a device that not only functions as a firewall, but can also provide you centrally controlled wifi, internet redundancy and bandwidth aggregation in one small package. Peplink has a variety of products, ranging from home office use up to big network devices for larger companies, but let’s focus on one of the products that should fall in the budget (~$500) and requirements of a small business. This product, the Peplink Balance One does some pretty incredible things if you have the right services to support it. It allows you to have 2 internet service providers, with automatic fail-over in the event one goes down. It also allows you to aggregate your download bandwidth so that you can take advantage of the bandwidth across multiple providers. If you are a larger company, they have more robust devices that allow for inbound redundancy and automated fail-over (good if you host your own websites) and they can also provide bonded VPN circuits for your satellite locations. Now let’s tie this back to procurement and saving money… Here’s how it works: Let’s say you want a nice stable reliable internet connection at your corporate office. It’s a data T-1 circuit and costs $400/month. But you are worried that the T-1 is only 1.5mbs and doesn’t support your bandwidth requirements. You contact your carrier, and they say can offer you a T-1 (x2) for only $700/month. That’s a bit pricey, and still not enough bandwidth at only 3Mbps. Another call in and your offered a 20Mbps fiber connection, but the price will now be $1,650/month. That’s way too expensive to justify and is still a single point of failure. As an added bonus, your CFO starts chastising you because she has 75/75 service from FIOS at her home and only pays $180/month; and it comes with HBO. But she doesn’t want to hear that FIOS isn’t available in your building nor that the services aren’t necessarily the same for businesses. Alternatively, you reach out to Comcast who says they can provide a 75/50 circuit for only $160/month. That deal is great, but you don’t trust Comcast as far as you can throw them in terms of network up-time and customer support. Sure, they only suffer temporary outages 2 or 3 times a month, and they only last a few minutes at a time, but that time could cost you hundreds, if not thousands of dollars in productivity. This is where the Peplink (and products like it) can really shine. What you do is get the T-1 @ $400/month AND get the Comcast at $150/month. Both of these plug into the Peplink at the same time. You set the T-1 to be your primary circuit, but you allow Comcast to be a failover. This means, if your T-1 goes down, traffic in and out will route on Comcast; and vice versa. 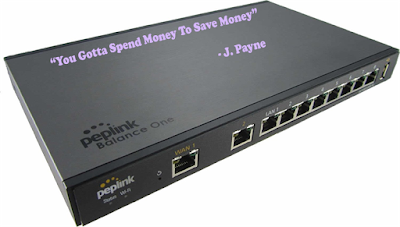 More importantly, the Peplink will aggregate your outbound traffic and allow you to have more download bandwidth. This means that users now have access to the 1.5Mbps from the T-1 AND the 75/50Mbps from Comcast; without needing to change a thing. It’s a seamless experience for the end-users, and for the most part, once it’s configured you never have to change a thing. And if you’ve switched to a hosted voice provided (VOIP), you’re in luck. You’ll now also have redundancy in your voice communications. If your primary circuit goes down, your phone (sip traffic) will now simply route over that backup circuit. It’s a bit of an oversimplification of course, and you do need to read up on how to install these things; but is a really good option and they are actually pretty easy to install. Products like the Peplink have long existed in the large corporate environment, but were often unobtainable in terms of price and were primarily focused on fail-over redundancy at data centers. Now, as with all things technology, the price has been driven down and they have become products that every day users can obtain. This allows them to be used in a money-saving capacity with the added benefit of building redundancy in your voice and data networks. Our phones don't work, can you advise on the same? Hi Anon - Is this still a problem? Please advise of the same.